Big specimen of fluorite from Grabina I quarry, size 11,2 cm. Coll. "Spirifer" Geological Society. Fot. J. Scovil. size about 10cm. size 15,5 cm. 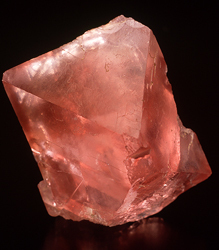 from Zimnik quarry, size 5.1 cm. The pegmatites of the Strzegom-Sobótka granitic massif have been known since more than 150 years. In the past as well as nowadays they provide many interesting mineralogical specimens. Diversity of the minerals – almost 60 known untill now, rare paragenesis and more than 100 years of history of the researches, done in a significant part by famous mineralogists, make the Strzegom region one of the classic mineralogical locations in Europe. Additionally, contrary to other classic European locations which in the major part „disappear” with the mines closure – in the Strzegom region there are tens of quarries and new ones are being opened all the time. 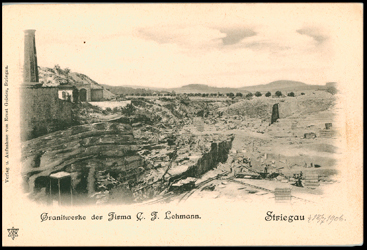 Old postcard with Barcz (Bartsch) quarry. 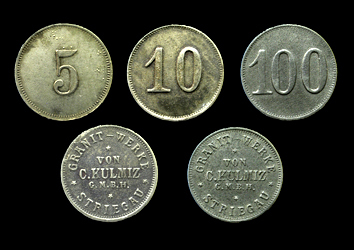 Local coins produced by owner of quarry to pay to his miners. After they can by with this coins only in store owned by the same man. Probably about 1920. Coll. "Spirifer" Geological Society. The first traces of exploitation of the local granite come from Neolithic age when it was used to produce querns. In the Bronze age (about 2,500 years ago) the granite from the eastern part of the massif was used to make many sculptures connected to a pagan cult, which the Sleza mountain was a centre of. In the Middle Ages the local granite was used to build churches and other buildings in the nearby area as well as in rather distant Wroclaw. The biggest rise of the granite exploitation in the Strzegom region took place in the 19th century. In 1826 the Bartsch family opened the first „big” quarry situated not far from Strzegom (today the quarry is called „Barcz”). The next big excavations took place in 1858 (quarry „Zbik”), and in 1890 exploitation in „Andrzej” quarry began. Now there are tens of big quarries working in the Strzegom-Sobótka massif. Specimen of stilbite with label dated about 1900. 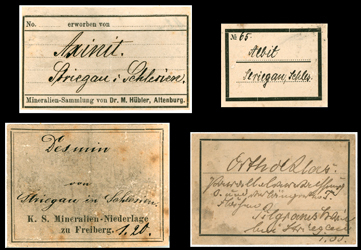 Old labels of Strzegom specimens - 1880-1920. 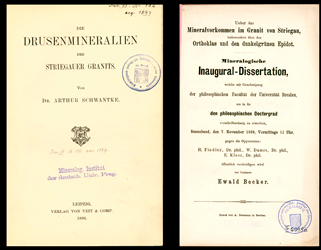 Cover pages of two historical monographs about Strzegom minerals. Books from collection of "Spirifer" Geological Society. During the exploitation of the granite pegmatite, druses containing magnificent specimens of different minerals were found many times. And that is why since the mid 19th century, the pegmatites were a target of intensive researches of many German mineralogists (the area belonged to Germany until 1945), among them the most famous of that time like: Hinze, Schwantke, Traube and Websky. One of the most interesting papers of that period is A. Schwntke`s : „Die drusenmineralien des Striegauer granits”. After the Second World War, as the region was united to Poland, the Strzegom pegmatites become a target of interest of Polish mineralogists. J. Janeczek published his work: ”Typomorphic minerals of the Strzegom-Sobótka granitic massif pegmatites” (”Typomorficzne minera?y pegmatytów masywu granitowego Strzegom-Sobótka”), in which he describes 57 minerals present in the pegmatites. Papers of A. Kozlowski allowed to define the conditions of crystallization of the minerals present in the druse pegmatites. Although the pegmatites` researches go on from more than 150 years, its mineral inventory is still being completed with other minerals and many scientific papers are being published. General map of area between Strzegom and Jawor with marked most important quarries. Detailed map of Strzegom Town area with marked all most important quarries. 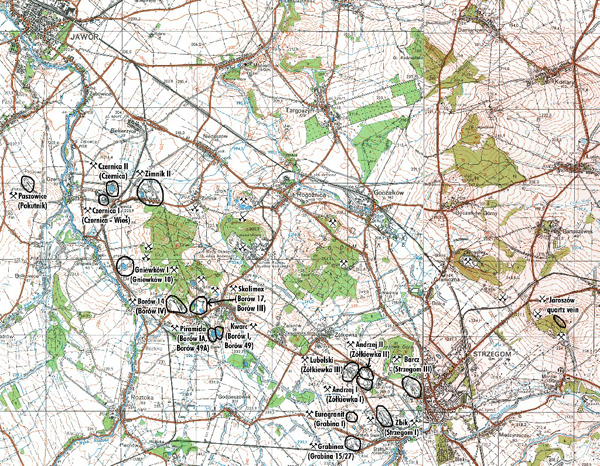 Detailed map of Borów area with marked all most important quarries. Detailed map of Czernica area with marked all most important quarries. The Strzegom-Sobótka granitic massif, called also the Strzegom massif, is situated in the central part of the Sudety`s foreground, about 50 km on SSW from Wroc?aw. It is outspread from Sobótka through Strzegom all the way to Jawor. Its maximum widht is about 12 km, and the length - about 50 km. Through its centre runs the Strzegom-?widnica dislocation, which divides it in two parts. The areas, in which the granitoids go out to the ground`s surface are covered with mild hills (for example the Strzegom Hills - Wzgórza Strzegomskie), with many small, working quarries. Because Strzegom is the only big town in the region where the most interesting specimens occur, the majority of the pegmatites of the Strzegom-Sobótka massif has such a location given, irrespective of the quarry it is from. In older collections and in the literature before the Second World War the generally used name of this location (used incorrectly by some collectors until today) is German Striegau, which was the name of present Strzegom. We will concentrate our attention on the exposures in which interesting mineralogical and collection specimens occur, that is to say – situated on W i NW from the town Strzegom. Granites are also exploited on the rest of the massif`s area, but do not give any interesting specimens. Nowadays in the W part of the massif the number of working quarries comes up to about 30, and every year the new ones are opened because of the growing demand for the Strzegom granite. 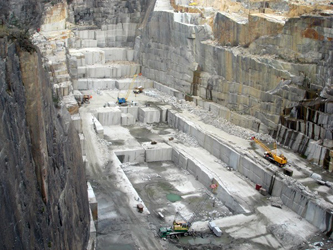 The most important quarries, from which the biggest part of the specimens comes, are situated in three areas – Strzegom surroundings (among other quarries: Andrzej, Lubelski, Krakowski, Barcz, Grabina), Kostrza-Borów area (among other quarries: Piramida, Kwarc, Wecom, Borów) and Czernica neighbourhood (for example the quarries: Czernica, Zimnik, Gniewków, Paszowice). The Strzegom granite is used to produce setts, flagstones, kerbs, as a facing stone etc. Because it is necessary for the production of facing boards to gain big blocks, the exploitation in the quarries proceeds in a very specific way. Explosives are not practically used, but only burners the blocks are „burned” with. The second commonly used method is to drill rows of holes and to put inside them a special material which enlarges their size, causing the rock`s crack. The majority of the excavations are not large, with the diameter up to few hundred metres, a wellform - sometimes deeper than wide – with completely vertical walls, even 100 m high! That is why it is possible to go down to the bottom of the majority of the excavations only by steep stairs and ladders. There are many cranes (similar to carnes in ports) placed around the excavations (specially in the Kostrza-Borów region) which are used to transport equipment to the bottom and to pull the granite blocks up. The material gained during the exploitation is divided in two parts – the bloks are sold to stone - masons and the rest of the rock is processed with special „guillotines” to setts. Fragments of the rock with diversified structure (among the others pegmatites and aplites) are thrown on dumps. The applied exploitation methods are very advantageous to gain specimens, which are found during the exploitation of the rock – mainly bigger geodes (for example in Grabina quarry a geode was found in which in 2005 some perfect quality chabazite on epidote specimens were found) as well as during the ”setts” stage – mainly small caverns. 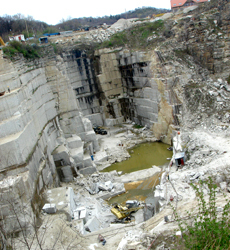 Czernica II quarry in 2007. Fot. T. Praszkier. 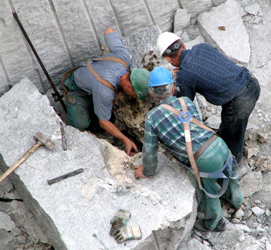 Miners examining pocket in Zimnik quarry, in 2007. Fot. R. Siuda. 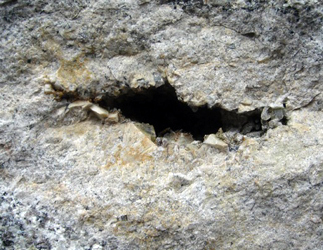 It has to be underlined that a big problem with exploitation of the minerals from druses (specially the bigger ones) is to detach the specimens from the rock – the majority of the pegmatites inhere in a perfectly solid granite without cracks. Because the specimens are got out without any permission of the quarries` owners, and often in hiding, the miners have no time for a professional extraction of the specimens and they only tear off „what they can” –most often so called points (quartz crystals).In connection to a very minute „mineralogical” awareness of the miners, a big part of the specimens is being distructed right after the output – unwrapped specimens transported in a rucksack or bavenite „washed off” as a „needless wool” are a normal practice. A story of one miner from Zimnik quarry can be given as an example. After a visit at his home, where many fragments of the „bavenite wool” were everywhere, asked about the discovery, the miner answered – „There was so much of the wool that I`ve made a „pillow” of it as I was sitting on a rock to have my breakfast”. Rocks of the Strzegom-Sobótka massif belong to postorogenic granites related to the variscic orogenesis. On the North the massif is surrounded by Old Paleozoic metamorphic rocks (mica schists, quartzites). On the East it contacts the Sleza ophiolite built – up mostly of gabbros, serpentinites and amphibolite. On the Southern East the granite adheres to the block of Góry Sowie (Sowie Mountains), built mainly of gneiss and migmatites dated late Proterozoic – early Paleozoic. On the Northern East the confines of the massif are determined by the sudecki fault which separates them from the metamorphic of Góry Kaczawskie (Kaczawskie Mountains). Within the Strzegom-Sobótka massif few granitoids forms have been isolated. On the West, from Paszowice to Strzegom, a hornblende – biotite granite exposes. More on the NE biotite granite appears (Graniczna – Morawa (Morów) area). In the eastern part of the Strzegom-Sobótka massif prevails mostly biotite granodiorite (Strzeblów, Golaszyce) and granite bimicaceous (Wierzbna, Siedlimowice). All the granitoids belong to separates plutoniums, characterized by clear petrographic, geochemical and isotopic variability, which indicates their separate evolution. Besides, some of the plutoniums differ among them in age, which for the biotite-hornblende, biotite granites and for the biotite granodiorite is about 280 million years, and for the bimicaceous granite - about 320 mya. Unfortunately the most part of crystalline rocks is covered by younger formations, which makes impossible to track the contact between them. The frequency of the pegmatites formations, their geometry and mineral composition are different in each part of the Strzegom-Sobótka massif. The richest in pegmatites, and in the same time in mineralogical specimens, is the biotite-hornblende granite appearing in the NW part of intrusion. The most commonly occur in it miarolitic pegmatites, accompanied by less often found vein pegmatites. 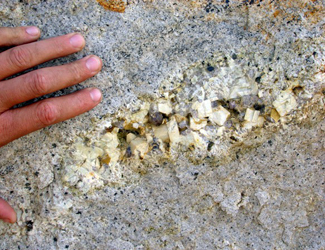 Both types of the pegmatites show a clear connection to fine – grained aplite veins. Size of separate pegmatites is different. In the 70`s of the 20th century big miarolitic pegmatites were found many times. For example, in 1968 in a quarry in Czernica an irregular cavern of size 1,3x2,2x3 m was discovered. 2/3 of its high was filled up with bits and whole crystals of smoky quartz and morion. Also nowadays, with the renewed rise of the mining and the rise of the granite exploitation, many caverns, sometimes of a considerable size, are found. In recent years in „Andrzej” and „Lubelski” quarries were found few geodes of the size about 2x1x0,5 m filled in a big part with smoky quartz covered by epidote, chabazite, fluorite and axinite. But mostly one can find pegmatites with the diameter up to tens of cm, in which the cavers constitute only a small percentage of their total size. From such pegmatites come, in major part, the best mineralogical specimens – small geodes (till ca 0,5m) are usually not weathered, while big caverns are mostly cut by small master joints running through granites, with meteoritic waters flowing within, accelerating the weathering process. The mineral composition of the miarolitic pegmatites is very diversified. The main role in their formation has quartz and K- feldspar, accompanied often by: epidote, albite, stilbite, calcite, fluorite, chabazite, axinite, and other, rare minerals. size of block about 50 cm. Coll. and Fot. A. Korzekwa. wide about 30 cm. Fot. T. Praszkier. The minerals crystallized in few steps. In the first one the crystallization of the K- feldspar, albite and the first generation quartz appeared. After this stage, in a part of the caverns one can observe breccia of the feldspar crystals and the first generation quartz. On older minerals, or on their breccia and often regenerated fragments, there are: fluorite, epidote, zeolites, chlorites and calcite growing. Frequency of the pegmatite druses occurence on the discussed area is irregular and at the same time very low. Big geodes are discovered usually once every 2-3 years, sometimes up to 2-3 times a year – with about 40 quarries working! Smaller caverns are more often, but not common. The major part of the found geodes (no matter the size) does not contain good quality specimens. In the eastern part of the massif there are no miarolitic pegmatites. Here vein pegmatites dominate, thickness of which goes up to tens of centimeters and their extent – up to few hundred metres. There are no caverns in these pegmatites. They have also different mineral composition than the pegmatites from the Western part of the Strzegom-Sobótka massif. Their prevalent compositions are: quartz, feldspars, biotites and muscovite, and sometimes garnets and beryls appear. Other minerals are rare. Generally the minerals from this part of the massif do not give good quality mineralogical specimens. 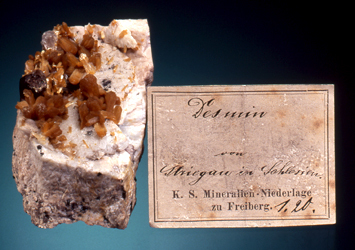 At the beginning of this chapter it is worth pointing that the best and the most requested by collectors specimens from Strzegom are paragenesis of many various minerals (often quartz, feldspars, epidote, chabazite, stilbite, bavenite, calcite and others), forming unusually colourful and at the same time rarely found „rocky gardens” (that is how the miners call the multimineral geodes) – for example creamy feldspar with smoky quartzes, yellow stilbite and violet fluorite, or smoky quartzes with pistachio epidote, covered by red chabazite… More seldom are good, world class monomineral specimens, or „one crystal” – such specimens are formed only by quartz, fluorite and feldspars. Nowadays there are almost 60 minerals known from the pegmatites of the Strzegom – Sobótka massif, many of them form macroscopic size crystals. Below we describe only the most common and/or the most interesting ones. Quartz is, together with K - feldspar, the most common mineral in the pegmatites of the Strzegom-Sobótka massif. Almost in all the quarries of the W part of the Strzegom – Sobótka massif we can find bigger or smaller specimens of crystals of various types of the mineral. Usually they are formed in hexagonal prisms terminatedon one side by rhomboedron surfaces, sometimes ditrigonal trapezohedrons can be observed. The most interesting, collection specimens, come from microlitic pegmatites of Strzegom area, Kostrza-Borowo and Czernica. Quartz crystals are usually smoky or entirely black, but one can also find specimes of completely clear rock crystals (among other in Barcz quarry). They grow from graphic intergrowths of K- feldspar and grey quartz, forming showy specimens of few quartz crystals „outgrowing” directly from a big feldspar. The quartz crystals size is from few milimetres up to tens of centimetres. The biggest crystals ever known come from Czernica quarry, where a cavern containing crystals with total mass circa 1 ton was found. The biggest of the crystals collected then has the size 64x40x30 cm and the weight 66 kg. It is a crystal perfectly terminated on one side and on the other – broken and regenerated by later quartz generations. Besides the damaged and regenerated later specimens, biterminated crystals were also found. Quartz in this cavern was accompanied by microcline and albite. Within the quartz crystals present in the microlitic pegmatites one can distinguish two generations of the mineral. The older generation (I) is a non-transparent quartz, smoky or morion, containing a big number of inclusions. The surface of the I generation crystals is usually lightly corroded and mat. The I generation crystals are often surrounded by the II generation of quartz. It is usually transparent or lightly smoky and has lustrous surfaces. Such a system makes the I generation crystals form phantoms visible within the II generation quartz. Often the quartz crystals are separated from the matrix and regenerated from the bottom by the II generation of quartz. In parallel with the II generation were also growing, among others, epidote and bavenite, often forming inclusions within quartz, which usually continue „outside” the crystal. On the second generation of quartz grow: epidote, bavenite, axinite, stilbite, calcite, fluorite, chabazite and chlorites. K-feldspar, is together with quartz, the most common mineral in the pegmatites of the described area (it is present in all the pegmatites). The K-feldspar present in pegmatite druses, denominated earlier as orthoclase or microcline, is in reality microcline microperthite. Within the pegmatites we can distinguish two basic morphotipes of feldspar crystals. The first one are short – columnar crystals crystals, with very well developed and often lustrous surfaces (110), (101), (010), (001) i (201). This type of feldspars are usually present together with quartz, albite, chlorite i zeolites. The second morphotipe of feldspar crystals are columnar - habit crystals crystals, sometimes rather highly elongated, with well developed surfaces (010) i (110). This type is called a „Zillertal” one. Very often this type`s crystals are twinned according to the Baveno low. This type of twins forms characteristic, fasten-like intergrowths, built – up of two dominating crystals. Smaller crystals grow on their surfaces. More seldom than the Baveno - low twining we can observe Carlsbad – low twins.Big quantity of epidote is present together with this type of feldspar. It is a noteworthy fact that the two types of feldspar crystals do not appear together in the druse pegmatites of Strzegom area. The feldspars appearing in the pegmatites have various colours. Usually the crystals are light yellow, creamy or almost white. Brown Manebach and Carlsbad twins and green crystals similar to amazonite were also described. Usually the K- feldspar crystals are few cm big. Sometimes bigger specimens of few kg and size of 30-35 cm (the second morphotipe) can be found. Sodium feldspar – albite – is one of the most common minerals in the pegmatites of the Strzegom-Sobótka massif. It is considered younger than K - feldspar and replaces it in many places. Albite appears as perthite lamellae in K - feldspar as well as graphic intergrowths and automorphic crystals growing on K - feldspars and quartz crystals` surfaces, which accompany them. Usually it formes crystals up to few milimetres of diameter, but often one can find much bigger crystals. Their colour is usually white, sometimes with a greenish shade. Colourless, entirely transparent variants called cleavelandite are also popular. Sometimes albite forms exceptionally showy concentrations of blue crystals similar to a „flower”. On the albite surface younger minerals often grow. The most interesting albite specimens appear in the quarries of Strzegom area. Axinite specimens from the pegmatites of the Strzegom-Sobótka massif are relatively rare and usually have the size up to few milimetres. Bigger specimens up to 2 cm are also known. 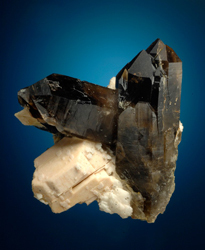 Axinite crystals are usually lustrous and transparent, brown or dark- plum colour. Axinite grows on quartz, feldspar or epidote. The most interesting Fe - axinite come from Strzegom area, in particular the quarries „Andrzej”, „Lubelski” and „Krakowski”. 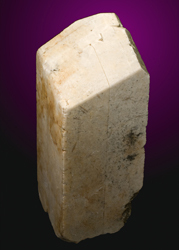 Cubic crystals of the chabazite from the miarolitic pegmatites reach more than 2 cm of the size. They have usually brown-red, brown, yellow-brown, more seldom blood red colour. They grow on older epidote, feldspar and quartz. Sometimes chabazite form unusually showy red crystals growing on green epidote in paragenesis with white feldspars – such specimens are probably ones of the best chabazite specimens in the world. The most interesting specimens of this mineral come from the quarries in Strzegom area (for example Eurogranit, Andrzej) and in the surroundings of Czernica (for example Paszowice). Epidote is one of the most common minerals of the pegmatite druses on the described area. Its crystallization began after emanation of the first generation quartz. Usually it forms acicular crystals, concentrated in radial aggregates, which reach up to few cm of lenght. Epidote has green, green – grey or grey colour. Crumbled crystals of smoky quartz and feldspar cemented by owergrowing crystals of epidote and calcite are often found. On the surface of epidote crystals grow axinite and chabazite crystals, zeolites and chlorites. The best epidote specimens form intensive green, lustrous crystals, concentrated in aggregates, growing on black quartz and white or creamy feldspar. Epidote is accompanied by clinozoiste. It forms grey crystals building radial or fan – shaped aggregates that have up to 4 cm. Epidote and clinozoiste appear commonly in all the quarries of Strzegom, Kostrza-Borów and Czernica areas. Calcite belongs to the last generation of the minerals from the druse pegmatites of the do Strzegom-Sobótka massif. It forms coarse - crystalline, massive aggregates, filling completely interiors of some caverns.This calcite has usually light yellow or orange colour. 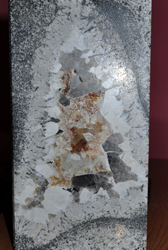 Often, together with epidote it cemented breccia consisted of quartz crystals and feldspar. The frequency of calcite appearance in the Strzegom area quarries is very diversified. In some part of the quarries it is rare or does not appear almost at all, in Czernica region and in some quarries in Strzegom area (for example Andrzej) it appears often enough, while in the quarries Piramida and Kwarc in Kostrza it is one of the most common minerals – the only ones good quality collection specimens come therefrom. In all the locations, except the quarries Piramida and Kwarc, calcite appears in the form of dark yellow tabulars of hexagonal habit light yellow to white crystals built – up in so called papierspath shape. While in the quarries Piramida and Kwarc calcite forms a whole spectrum of forms – from grey or colourless, thin 1-2 centimetres „needles”, through black hexagonal prisms terminated by a pinacoid up to 20 cm, dark yellow tabular crystals, up to short - columnar white crystals with a grey or green central part. The majority of them are characterized by the presence of a hexagonal prism and a rhombohedron or a pinacoid, appearing in different proportions.Some of these shapes show also different generations, which sometimes grow on each other. More seldom crystals of rhombohedral shape appear. This minerals appears mainly in the vein pegmatites that expose in the eastern part of the Strzegom-Sobótka massif. 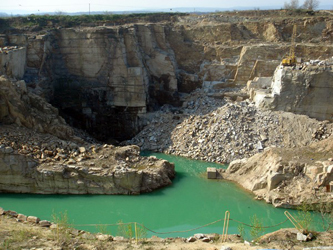 Its major quantity is found in Siedlimowice quarry. It appears there in a shape of short - columnar, light green or slightly yellowish crystals ca 2 cm long. Sometimes one can find also bigger crystals up to 10 cm. Usually they are very strongly cracked, sometimes secondary cemented by quartz and do not form showy specimens. They are accompanied by feldspar, muscovite and garnet (spessartine-almandine). But the most beautiful beryl crystals related to vein pegmatites come from Strzeblowa, where light green, transparent beryls, up to 10 cm long were found. In the miarolitic pegmatites beryl appears seldom. It forms colourless or greenish crystals up to 3 cm long. They are also know from the quarries of Strzegom, ?ó?kiewka and Zimnik. In the last town green, transparent beryl crystals up to ca 4 cm long were found – it is the best specimen of this mineral ever known from Poland. Bavenite appears exclusively in the miarolitic pegmatites in the western part of the Strzegom-Sobótka massif. It forms acicular, white crystals, usually concentrated in fibrous, felt aggregates (similar to cotton wool) filling interiors of some pegmatites. Sometimes their size reaches tens of cm! One can find also „spheric” aggregates up to 2 cm of diameter, growing on surface of feldspars, quartz, epidote and zeolites. Bavenite appears in a shape of acicular, scolecite - like crystals up to 1 cm long very seldom. Inclusions of acicular bavenite crystals in smoky quartz can be often found. The most interesting specimens of this mineral minera?u appear in the region of Czernica and Kostrza, although they are being found in all the quarries of the W part of the massif. Molybdenite appears relatively seldom on the described area – generally in the W part of the Strzegom-Sobótka massif, directly in granites or in aplite veins cutting them. However the most beautiful specimens of the mineral come from the miarolitic pegmatites of Strzegom, Zimnik, Paszowice and Czernica. The molybdenite crystals grow there on K - feldspar in a form of silver, lustrous, tabular crystals of hexagonal habit – sometimes their size reaches 1,5 cm. Fluorite crystals are relatively rare in the Strzegom-Sobótka massif and known entirely from the miarolitic pegmatites. They are generally very diversified by the colour, shape and size – practically every new „hit” brings slightly different specimens. The crystals colour is various – the most common are the violet or bluish ones, more seldom blue and colourless, pink – red crystals appear occasionally. 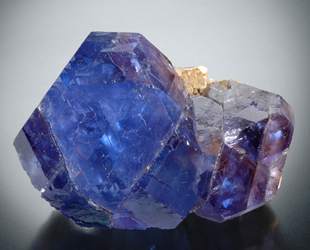 The blue and violet crystals often change the colour depending on a light type – the most spectacular of them have an intensive blue colour in the day light, while in an artificial light – intensive dark violet. Sometimes in the crystals colour zonality is visible or coloured phantoms which show with their shape other crystalographic habit – for example octahedrons closed in a rhombic dodecahedron. Fluorite crystals are usually built in the shape of octahedrons. Combinations of octahedron and pyramidal octahedron, pyramidal hexahedron and rhombic dodecahedron are more seldom found. Usually the crystals size does not exceed 1-2 cm, although much bigger specimens appears. The biggest ones reach up to 15 cm and often form world class specimens. Big crystals seldom „preserve themselves” in paragenesis with other minerals – in connection to their perfect cleavage they have a tendency to fall off the crystal clusters. A good example can be the discovery of big violet – blue fluorite crystals of dodecahedron shape, with octahedron phantoms from the Eurogranit quarry in autumn 2004. A number of high class blue crystals dozen cm long were found then, unfortunately none of them did not preserve on matrix. Smaller crystals – up to ca 3 cm often „stay” on matrix, where accompanied by epidote, stilbite or bavenite grow on the surface of feldspars and quartzes. Sometimes bavenite and epidote form inclusions in fluorite crystals.